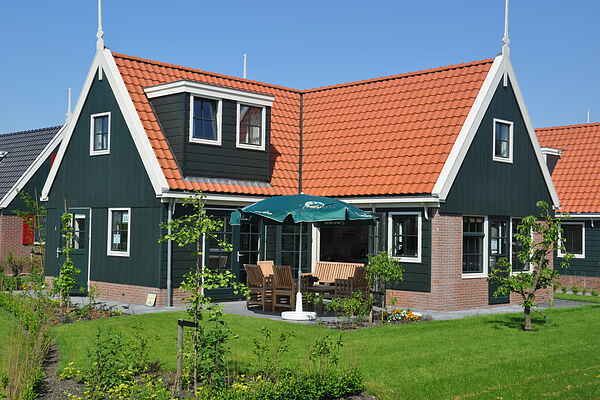 These detached accommodations at Resort de Rijp are all constructed in the traditional Zaan style. You can choose from a variety of comfortably furnished types. The L-shaped, 6-person De Rijp type (mh30775) offers a very spacious layout. The Waterland type is available as a 6-person villa (mh30776) or an 8-person villa (mh30778). The specially designed 8-person Marken type (mh30777) is built on high stilts on the water . The Velthorst type (mh30779) is a single-storey chalet situated on the water. Whichever accommodation you choose, you will have a spacious garden and a terrace with garden furniture.